Journal of the House of Lords Volume 38, 1787-1790. Originally published by His Majesty's Stationery Office, London, 1767-1830. DIE Jovis, 12o Martii 1789. DIE Lunæ, 16o Martii 1789. DIE Martis, 17o Martii 1789. DIE Mercurii, 18o Martii 1789. DIE Jovis, 19o Martii 1789. DIE Veneris, 20o Martii 1789. Epus. Meneven. Ds. Thurlow, Cancellarius. March. Stafford, C. P. S.
Comes Stanhope. Ds. Sydney, Unus Primariorum Secretariorum. Ramsay and Gordon against Magistrates of Edinburgh. The Answer of the Lord Provost, Magistrates, and Council of the City of Edinburgh, to the Appeal of Major George Ramsay of Peppermiln, and Charles Gordon Esquire of Braid, was this Day brought in. 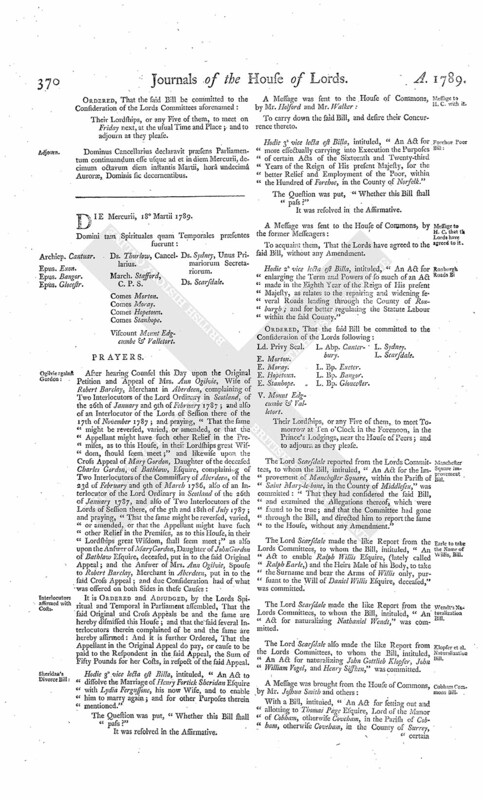 The Lord Scarsdale reported from the Lords Committees, to whom the Bill, intituled, "An Act for dividing and enclosing certain Ings or Meadow Ground called Bradley Ings, and Two Moors or Commons called Upper Bradley Common and Lower Bradley Common, within the Manor of Bradley, in the Parish of Kildwick, in the West Riding of the County of York," was committed: "That they had considered the said Bill, and examined the Allegations thereof, which were found to be true; that the Parties concerned had given their Consents to the Satisfaction of the Committee; and that the Committee had gone through the Bill, and directed him to report the same to the House, without any Amendment." Fitzherbert's Petition referred to Judges. It is Ordered, That the Consideration of the said Petition be and is hereby referred to the Lord Chief Baron of the Court of Exchequer, and Mr. Baron Hotham, who are forthwith to summon all Parties concerned in the Bill; and after hearing them, are to report to the House the State of the Case, with their Opinion thereupon under their Hands; and whether all Parties, who may be concerned in the Consequences of the Bill, have signed the Petition; and also, that the Judges, having perused the Bill, do sign the same. Honeywood et al. Petition referred to Judges. Ld. Milford or Sir J. Philipps' Estate Bill. Hodie 2a vice lecta est Billa, intituled, "An Act for vesting certain Estates devised by the Will of Sir John Philipps Baronet, deceased, in Trustees to be sold, and for investing the Money arising from the Sale thereof in the Purchase of other Lands, to be settled to the Uses devised by the said Will of the Estates so to be vested in Trustees to be sold." E. Stanhope. L. Abp. York. L. Bp. St.David's. L. Sydney. Their Lordships, or any Five of them, to meet on Friday the 27th Day of this Instant March, at Ten o'Clock in the Forenoon, in the Prince's Lodgings, near the House of Peers; and to adjourn as they please. Hodie 2a vice lecta est Billa, intituled, "An Act for more effectually carrying into Execution the Purposes of certain Acts of the Sixteenth and Twenty-third Years of the Reign of His present Majesty, for the better Relief and Employment of the Poor within the Hundred of Forehoe, in the County of Norfolk." The House being moved, "That a Day may be appointed for hearing the Cause, wherein Major George Ramsay, and Charles Gordon Esquire, are Appellants, and the Lord Provost, Magistrates, and Council of the City of Edinburgh, are Respondents:"
It is Ordered, That this House will hear the said Cause by Counsel at the Bar, on the First vacant Day for Causes, after those already appointed. Mr. William Walker was called in, who being sworn, acquainted the House, "That on the 16th of February last, he called at the House where Mrs. Sheridan and Mr. Newman lodge, when he saw Mr. Newman, and asked him, "Whether Mrs. Sheridan was at home" and told him he came to serve her with a Copy of the Bill, and the Order of the House for the Second Reading of it, and that he gave them to him: That Mr. Newman said, "She was not at home;" upon which the Witness ran up Stairs into a Room, where he saw a Person whom he now knows to be Mrs. Sheridan, who upon seeing the Witness immediately quitted the said Room: That shortly after Mr. Newman brought word that Mrs. Sheridan did not chuse to be served with the Copy of the Bill and Order of the House, to which the Witness answered that he must then petition the House of Lords, that Service of the said Copy and Order at the House of the said Mrs. Sheridan, might be deemed good Service upon her: That Mr. Newman then told the Witness to call again, which he did, when Mr. Newman introduced him to a Person, and told him that she was Mrs. Sheridan, who, upon Witness asking whether she had received the Copy of the Bill, and the Order of the House for the Second Reading of it, made answer that she had." Then Mr. Thomas Bund was called in, and being sworn, acquainted the House, "That he was present at the Marriage of Major Sheridan and Miss Lydia Fergussone some Time in the Month of July 1770, in the Parish Church of St. Helen's, in the City of Worcester, which Marriage was had with the Approbation of the said Miss Fergussone's Mother, (her Father being dead before that Time;) that he knows the said Lydia Fergussone very well; that he was a subscribing Witness to the Register of the said Marriage; and drew the Marriage Settlement." This Marriage was solemnized between us Henry F. Sheridan. In the Presence of Susanna Bund. The above is faithfully extracted from the Parish Register of Marriages of St. Helen, in Worcester, by me, T. Bedford, Rector." 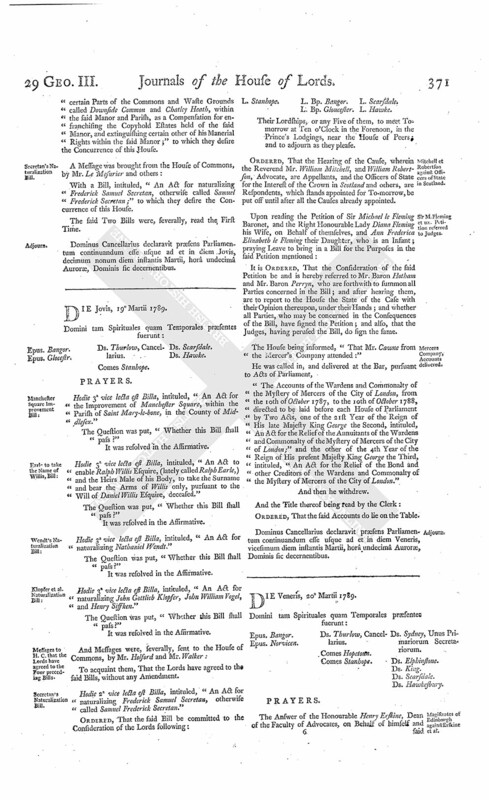 Then Mr. Mark Holman, Deputy Registrar of the Consistory Court of the Bishop of London, was called in, and being sworn, produced the Original Definitive Sentence of Divorce of that Court of the 7th of May 1788, against the said Lydia Sheridan, for Adultery committed by her with Francis Newman. Then Mr. Andrew Edge was called in, and produced an Office Copy of the Record of the Court of King's Bench of a Judgement given in that Court in Michaelmas Term 1788 against Francis Newman for Criminal Conversation with Lydia Sheridan for £ 2,000 Damages, besides Costs of Suit, which he said, "He had compared and examined with the Original in his Custody." Then Mrs. Sarah Sell was called in, and being sworn, acquainted the House, "That in the Year 1784, she lived at No. 1, Green's Row, Chelsea; that she knows Mrs. Sheridan very well, and was first introduced to her at Lowesback's Hotel in St. James's Street, where she found her in Company with Mr. Newman, upon Occasion of the latter sending for her (the Witness) to know if they could lodge at her (the Witness's) House; that the first Time they lodged with the Witness they continued with her about Nine Weeks, during which Time they lived as Man and Wife, and slept in the same Bed; that she received general Directions from them to say, when any Body called to enquire after them, that no such Persons lodged there; that during the above Nine Weeks Mrs. Sheridan did not tell the Witness who she was, but after their coming to lodge with the Witness a Second Time, which was about Christmas 1784, Mrs. Sheridan one Day in great Distress of Mind, and after making the Witness promise not to disclose the Conversation, told her she was not the Wife of Mr. Newman, but the Wife of another Gentleman; that they left the Witness's House on 26th April 1785; that the Witness afterwards on the 15th August 1785, saw Mrs. Sheridan and Mr. Newman at a Place called Caen, about Twelve Miles from Moulines, in France, and the next Day (videlicet) the 16th of August, Mrs. Sheridan was brought to-bed of a Son." Ordered, That the House be put into a Committee upon the said Bill on Monday next. This very dutiful and affectionate Address calls forth My warmest Thanks; the Sentiments expressed in it have so universally prevailed among My loving Subjects, that they must, if possible, increase My Solicitude for the Prosperity and Happiness of this My Native Country." Ordered, That the said Address, together with His Majesty's most gracious Answer thereto, be forthwith printed and published. Queen's Answer to Congratulatory Message. "It is impossible for Me to express how sensible I feel this marked Instance from the House of Lords, of their Duty towards the King, and Attention to Me, who am so particularly interested in this happy Event." Dominus Cancellarius declaravit præsens Parliamentum continuandum esse usque ad et in diem Lunæ, decimum sextum diem instantis Martii, horâ undecimâ Auroræ, Dominis sic decernentibus. Viscount Falmouth. Ds. Osborne, Unus Primariorum Secretariorum. Scott against Creditors of H. Seton. As was also, the Answer of Gideon Gray, Factor upon the sequestrated Estate of Hugh Seton of Touch, Esquire, to the Appeal of Walter Scott, Writer to the Signet. Rann et al. Petition referred to Judges. It is Ordered, That the Consideration of the said Petition be and is hereby referred to the Lord Chief Baron of the Court of Exchequer and Mr. Baron Hotham, who are forthwith to summon all Parties concerned in the Bill; and after hearing them, are to report to the House the State of the Case, with their Opinion thereupon, under their Hands; and whether all Parties, who may be concerned in the Consequences of the Bill, have signed the Petition; and also, that the Judges, having perused the Bill, do sign the same. Northey's Petition referred to Judges. Moland's Petition referred to Judges. Sir J. Ingilby's Estate Bill. Hodie 2a vice lecta est Billa, intituled, "An Act to enable Sir John Ingilby Baronet, to charge his Settled Estates in the County of York, in the Manner therein mentioned." V. Falmouth. L. Abp. Canterbury. L. Bp. Bristol. L. Osborne. Their Lordships, or any Five of them, to meet on Tuesday the 31st Day of this Instant March, at Ten o'Clock in the Forenoon, in the Prince's Lodgings, near the House of Peers; and to adjourn as they please. Hodie 3a vice lecta est Billa, intituled, "An Act for dividing and enclosing certain Ings or Meadow Ground called Bradley Ings, and Two Moors or Commons called Upper Bradley Common and Lower Bradley Common, within the Manor of Bradley, in the Parish of Kildwick, in the West Riding of the County of York." Upon reading the Petition and Appeal of William Waddel of Easter Moffat, Nephew and universal Disponee of the deceased William Waddel of Calderhead; complaining of Six Interlocutors of the Lord Ordinary in Scotland, of the 4th of July 1786; the 19th of June, 17th of July, 3d of August, 27th of November, and 13th of December 1787; and also of Three Interlocutors of the Lords of Session there, of the 20th of January, 10th of February, and 3d of March 1789; and praying, "That the same may be reversed, varied, or altered, or that the Appellant may have such other Relief in the Premises, as to this House, in their Lordships great Wisdom, shall seem meet; and that Elizabeth, Agnes and Ann Waddel, Sisters and Executors of the deceased Henry Waddel Writer in Edinburgh, and Andrew Clark Husband of the said Agnes Waddel, and John Watt their Factor, may be required to answer the said Appeal:"
It is Ordered, That the said Elizabeth, Agnes, Ann Waddel, Andrew Clark, and John Watt, may have a Copy of the said Appeal, and do put in their Answer or respective Answers thereunto in Writing, on or before Monday the 13th Day of April next; and Service of this Order upon the said Respondents, or upon any of their known Counsel or Agents in the Court of Session in Scotland, shall be deemed good Service. Chalmer to enter into a Recognizance on said Appeal. The House being moved, "That James Chalmer of Buckingham Street, York Buildings, Gentleman, may be permitted to enter into a Recognizance for William Waddel, on account of his Appeal depending in this House, he living in Scotland:"
It is Ordered, That the said James Chalmer may enter into a Recognizance for the said Appellant, as desired. With a Bill, intituled, "An Act for naturalizing Nathaniel Wendt;" to which they desire the Concurrence of this House. Klopfer's et al. Naturalization Bill. With a Bill, intituled, "An Act for naturalizing John Gottlieb Klopfer, John William Vogel, and Henry Siffken;" to which they desire the Concurrence of this House. With a Bill, intituled, "An Act for the Improvement of Manchester Square, within the Parish of Saint Maryle-bone, in the County of Middlesex;" to which they desire the Concurrence of this House. With a Bill, intituled, "An Act for the Naturalization of Jacob Siordet and James Lewis Siordet;" to which they desire the Concurrence of this House. With a Bill, intituled, "An Act for the Naturalization of Lewis Pourtales;" to which they desire the Concurrence of this House. Earle to take the Name of Willis, Bill. With a Bill, intituled, "An Act to enable Ralph Willis Esquire, (lately called Ralph Earle,) and the Heirs Male of his Body, to take the Surname and bear the Arms of Willis only, pursuant to the Will of Daniel Willis Esquire, deceased;" to which they desire the Concurrence of this House. 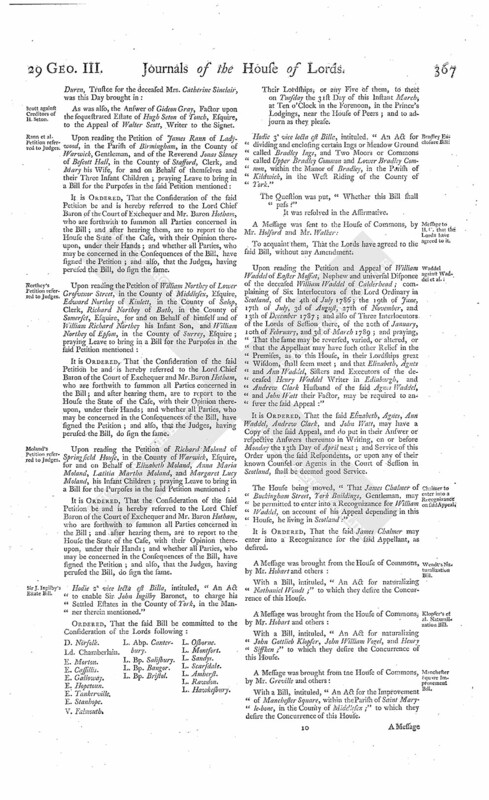 With a Bill, intituled, "An Act for enlarging the Term and Powers of so much of an Act made in the Eighth Year of the Reign of His present Majesty, as relates to the repairing and widening several Roads leading through the County of Roxburgh; and for better regulating the Statute Labour within the said County;" to which they desire the Concurrence of this House. The said Seven Bills were, severally, read the First Time. "Copy of the Treaty of defensive Alliance between His Majesty and the King of Prussia, signed at Berlin the 13th of August 1788. "—And Translation. Ordered, That the said Copy do lie on the Table. Upon reading the Petition of the Lord Provost, Magistrates, and Counsel of the City of Edinburgh, Respondents in a Cause depending in this House, to which George Ramsay and Charles Gordon Esquire are Appellants, which stands appointed for Hearing; setting forth, "That the Inhabitants of the City of Edinburgh have for some Time been in the greatest Distress through the Want of Water, particularly during the Summer and Autumn of last Year, and the Want is yet felt severely, and must be every Year more, from the great Increase of the Buildings, till a large additional Quantity is brought in; it is, therefore, of the greatest Consequence to the City, that this Cause should be soon heard, and in a Case so circumstanced, the Respondents are hopeful that their Lordships will see it proper to fix an early Day for the Hearing, Notice of this intended Application having been given to the Appellants Agent on Wednesday last, that they might be prepared;" and therefore praying, "That their Lordships will be pleased to direct this Cause to be heard on Monday the 30th of this Instant March, or on such other early Day as their Lordships may think proper:"
It is Ordered, That this House will hear the said Cause by Counsel at the Bar, on Monday the 30th Day of this Instant March, as desired. Armstrong against His Majesty's Advocate for Scotland. A Petition of David Armstrong Esquire, Appellant in a Cause depending in this House, and of His Majesty's Advocate for Scotland Respondent thereto, which stands appointed for Hearing, was presented and read; setting forth, "That the Lord Advocate of Scotland not having yet returned from Scotland, they are desirous that the Cause be put off till after all the Causes already appointed for hearing;" and therefore praying their Lordships, "To put off the hearing of this Cause till after all the Causes already appointed." Ordered, That the Hearing of the said Cause be put off till after all the Causes already appointed, as desired. Upon reading the Petition of James Bruce of Kinnaird, Esquire, Appellant in a Cause depending in this House, and of Colonel Thomas Dundas of Fingask, Respondent thereto, which stands appointed for hearing; setting forth, "That the Appellant some Time ago presented his Appeal to their Lordships, complaining of certain Interlocutors pronounced by the Court of Session in a Cause which depended between the Appellant and the Respondent's Father; that the Petitioners have now amicably settled the Matters in Dispute in the said Cause, and the Appellant is willing that the Interlocutors complained of by the said Appeal be affirmed;" and therefore praying their Lordships, "That the Interlocutors complained of in and by the said Appeal, be affirmed of Consent, and that each Party bear their own Costs:"
It is Ordered, That the said Interlocutors complained of in the said Appeal (by Consent of both Parties) be and the same are hereby affirmed without Costs. Mitchell against Officers of State in Scotland. A Petition of the Officers of State, for the Interest of the Crown in Scotland, and others, Respondents in a Cause depending in this House, to which the Reverend Mr. William Mitchell, Minister of Tingwall in Zetland, is Appellant, was presented and read; setting forth, "That this Cause which respects the Augmentation of the Appellant's Stipend, has been set down for Hearing ex-parte, the Heritors of the Parish, who have hitherto defended the Suit below, not having thought fit to put in an Answer to the Appeal; that as the Question decided by the Court of Session is of great Importance, not only to the Clergy of the established Church of Scotland, but to the Public, the Petitioners are desirous that the Matter may be fully and deliberately considered; and as the Lord Advocate of Scotland, whose Advice and Assistance is necessary, is yet detained in Scotland;" the Petitioners humbly pray their Lordships, "To put off the Hearing of this Cause to Monday the 30th Day of this Instant March, or to such other Day in the present Session, as to their Lordships shall seem proper." Ordered, That the said Petition do lie on the Table. With a Bill, intituled, "An Act for dividing and enclosing the Open Fields, Downs, Commons, and Commonable Lands, in the Manor and Parish of Lower Swell, in the County of Gloucester;" to which they desire the Concurrence of this House. The House (according to Order) was adjourned during Pleasure, and put into a Committee upon the Bill, intituled, "An Act to dissolve the Marriage of Henry Fortick Sheridan with Lydia Fergussone his now Wife, and to enable him to marry again; and for other Purposes therein mentioned." And the Lord Scarsdale reported from the Committee, "That they had gone through the Bill, and made some Amendments thereto, which he was ready to report when the House will please to receive the same." Dominus Cancellarius declaravit præsens Parliamentum continuandum esse usque ad et in diem Martis, decimum septimum diem instantis Martii, horâ undecimâ Auroræ, Dominis sic decernentibus. Epus. Bangor. Ds. Thurlow, Cancellarius. The Lord Scarsdale (according to Order) reported the Amendments made by the Committee of the whole House to the Bill, intituled, "An Act to dissolve the Marriage of Henry Fortick Sheridan Esquire with Lydia Fergussone his now Wife, and to enable him to marry again; and for other Purposes therein mentioned." The Lord Scarsdale reported from the Lords Committees to whom the Bill, intituled, "An Act for more effectually carrying into Execution the Purposes of certain Acts of the Sixteenth and Twenty-third Years of the Reign of His present Majesty, for the better Relief and Employment of the Poor, within the Hundred of Forehoe, in the County of Norfolk," was committed: "That they had considered the said Bill, and examined the Allegations thereof, which were found to be true; and that the Committee had gone through the Bill, and directed him to report the same to the House, without any Amendment." Hodie 2a vice lecta est Billa, intituled, "An Act for the Improvement of Manchester Square, within the Parish of Saint Mary-le-bone, in the County of Middlesex." E. Stanhope. L. Bp. Bangor. L. Scarsdale. Hodie 2a vice lecta est Billa, intituled, "An Act to enable Ralph Willis Esquire, (lately called Ralph Earle,) and the Heirs Male of his Body, to take the Surname and bear the Arms of Willis only, pursuant to the Will of Daniel Willis Esquire, deceased." Their Lordships, or any Five of them, to meet on the same Day, at the same Place; and to adjourn as they please. Klopfer et al. Naturalization Bill. Hodie 2a vice lecta est Billa, intituled, "An Act for naturalizing John Gottlieb Klopfer, John William Vogel, and Henry Siffken." Hodie 2a vice lecta est Billa, intituled, "An Act for the Naturalization of Jacob Siordet and James Lewis Siordet." Hodie 2a vice lecta est Billa, intituled, "An Act for the Naturalization of Lewis Pourtales." Hodie 2a vice lecta est Billa, intituled, "An Act for naturalizing Nathaniel Wendt." Upon reading the Petition and Appeal of the Stirling Banking Company, and the other Creditors on the sequestrated Estate of James Stein, late Distiller at Kilbagie, complaining of Three Interlocutors of the Lords of Session in Scotland, of the 11th of December 1788; and Two of the 4th of March 1789; and praying, "That the same may be reversed, or that the Appellants may have such other Relief in the Premises, as to this House, in their Lordships great Wisdom, shall seem proper; and that Messieurs Allan, Steuart, and Company, may be required to answer the said Appeal:"
It is Ordered, That the said Messieurs Allan, Stuart, and Company, may have a Copy of the said Appeal, and do put in their Answer or respective Answers thereunto, in Writing, on or before Tuesday the 14th Day of April next; and Service of this Order upon the said Respondents, or upon their known Agents or Solicitors in the Court of Session in Scotland, shall be deemed good Service. Lloyd to enter into Recognizance on said Appeal. The House being moved, "That Thomas Lloyd, of Bedford Row, Gentleman, may be permitted to enter into a Recognizance for the Stirling Banking Company and others, on account of their Appeal depending in this House, they residing in Scotland:"
It is Ordered, That the said Thomas Lloyd may enter into a Recognizance for the said Appellants, as desired. Hay et al. against Hay. The House being informed, "That Robert Hay, Respondent to the Appeal of Frances Hay and others, had not put in his Answer to the said Appeal, though duly served with the Order of this House for that Purpose:"
Ordered, That the said Respondent do put in his Answer to the said Appeal peremptorily in a Week. Hodie 2a vice lecta est Billa, intituled, "An Act for dividing and enclosing the Open Fields, Downs, Commons, and Commonable Lands, in the Manor and Parish of Lower Swell, in the County of Gloucester." Their Lordships, or any Five of them, to meet on Friday next, at the usual Time and Place; and to adjourn as they please. Dominus Cancellarius declaravit præsens Parliamentum continuandum esse usque ad et in diem Mercurii, decimum octavum diem instantis Martii, horâ undecimâ Auroræ, Dominis sic decernentibus. Epus. Glocestr. Ds. Thurlow, Cancellarius. Viscount Mount Edgcumbe & Valletort. Ds. Sydney, Unus Primariorum Secretariorum. 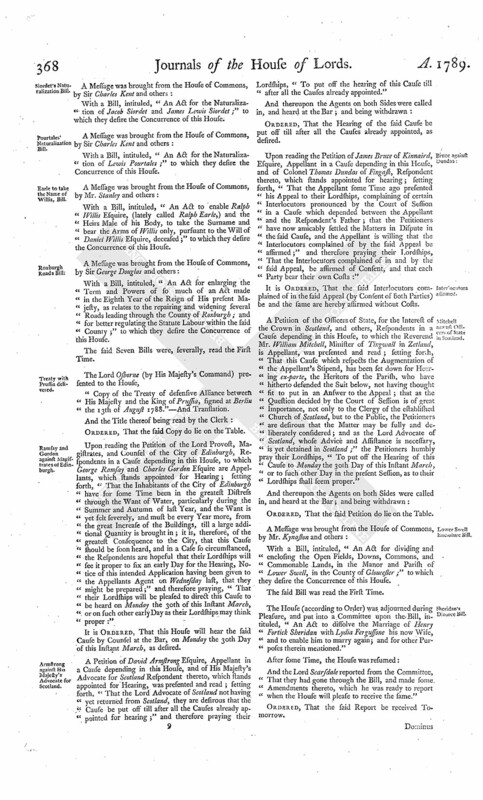 It is Ordered and Adjudged, by the Lords Spiritual and Temporal in Parliament assembled, That the said Original and Cross Appeals be and the same are hereby dismissed this House; and that the said several Interlocutors therein complained of be and the same are hereby affirmed: And it is further Ordered, That the Appellant in the Original Appeal do pay, or cause to be paid to the Respondent in the said Appeal, the Sum of Fifty Pounds for her Costs, in respect of the said Appeal. Hodie 3a vice lecta est Billa, intituled, "An Act to dissolve the Marriage of Henry Fortick Sheridan Esquire with Lydia Fergussone, his now Wife, and to enable him to marry again; and for other Purposes therein mentioned." Hodie 3a vice lecta est Billa, intituled, "An Act for more effectually carrying into Execution the Purposes of certain Acts of the Sixteenth and Twenty-third Years of the Reign of His present Majesty, for the better Relief and Employment of the Poor, within the Hundred of Forehoe, in the County of Norfolk." Hodie 2a vice lecta est Billa, intituled, "An Act for enlarging the Term and Powers of so much of an Act made in the Eighth Year of the Reign of His present Majesty, as relates to the repairing and widening several Roads leading through the County of Roxburgh; and for better regulating the Statute Labour within the said County." V. Mount Edgcumbe & Valletort. L. Abp. Canterbury. L. Bp. Gloucester. L. Sydney. Their Lordships, or any Five of them, to meet Tomorrow at Ten o'Clock in the Forenoon, in the Prince's Lodgings, near the House of Peers; and to adjourn as they please. The Lord Scarsdale reported from the Lords Committees, to whom the Bill, intituled, "An Act for the Improvement of Manchester Square, within the Parish of Saint Mary-le-bone, in the County of Middlesex," was committed: "That they had considered the said Bill, and examined the Allegations thereof, which were found to be true; and that the Committee had gone through the Bill, and directed him to report the same to the House, without any Amendment." The Lord Scarsdale made the like Report from the Lords Committees, to whom the Bill, intituled, "An Act to enable Ralph Willis Esquire, (lately called Ralph Earle,) and the Heirs Male of his Body, to take the Surname and bear the Arms of Willis only, pursuant to the Will of Daniel Willis Esquire, deceased," was committed. The Lord Scarsdale made the like Report from the Lords Committees, to whom the Bill, intituled, "An Act for naturalizing Nathaniel Wendt," was committed. The Lord Scarsdale also made the like Report from the Lords Committees, to whom the Bill, intituled, "An Act for naturalizing John Gottlieb Klopfer, John William Vogel, and Henry Siffken," was committed. With a Bill, intituled, "An Act for setting out and allotting to Thomas Page Esquire, Lord of the Manor of Cobham, otherwise Coveham, in the Parish of Cobham, otherwise Coveham, in the County of Surrey, certain Parts of the Commons and Waste Grounds called Downside Common and Chatley Heath, within the said Manor and Parish, as a Compensation for enfranchising the Copyhold Estates held of the said Manor, and extinguishing certain other of his Manerial Rights within the said Manor;" to which they desire the Concurrence of this House. With a Bill, intituled, "An Act for naturalizing Frederick Samuel Secretan, otherwise called Samuel Frederick Secretan;" to which they desire the Concurrence of this House. Dominus Cancellarius declaravit præsens Parliamentum continuandum esse usque ad et in diem Jovis, decimum nonum diem instantis Martii, horâ undecimâ Auroræ, Dominis sic decernentibus. Hodie 3a vice lecta est Billa, intituled, "An Act for the Improvement of Manchester Square, within the Parish of Saint Mary-le-bone, in the County of Middlesex." Hodie 3a vice lecta est Billa, intituled, "An Act to enable Ralph Willis Esquire, (lately called Ralph Earle,) and the Heirs Male of his Body, to take the Surname and bear the Arms of Willis only, pursuant to the Will of Daniel Willis Esquire, deceased." Hodie 3a vice lecta est Billa, intituled, "An Act for naturalizing Nathaniel Wendt." Hodie 3a vice lecta est Billa, intituled, "An Act for naturalizing John Gottlieb Klopfer, John William Vogel, and Henry Siffken." Hodie 2a vice lecta est Billa, intituled, "An Act for naturalizing Frederick Samuel Secretan, otherwise called Samuel Frederick Secretan." L. Stanhope. L. Bp. Bangor. L. Bp. Gloucester. L. Scarsdale. Mitchell et Robertson against Officers of State in Scotland. Ordered, That the Hearing of the Cause, wherein the Reverend Mr. William Mitchell, and William Robertson, Advocate, are Appellants, and the Officers of State for the Interest of the Crown in Scotland and others, are Respondents, which stands appointed for To-morrow, be put off until after all the Causes already appointed. Sir M. Fleming et ux. Petition referred to Judges. It is Ordered, That the Consideration of the said Petition be and is hereby referred to Mr. Baron Hotham and Mr. Baron Perryn, who are forthwith to summon all Parties concerned in the Bill; and after hearing them, are to report to the House the State of the Case with their Opinion thereupon, under their Hands; and whether all Parties, who may be concerned in the Consequences of the Bill, have signed the Petition; and also, that the Judges, having perused the Bill, do sign the same. 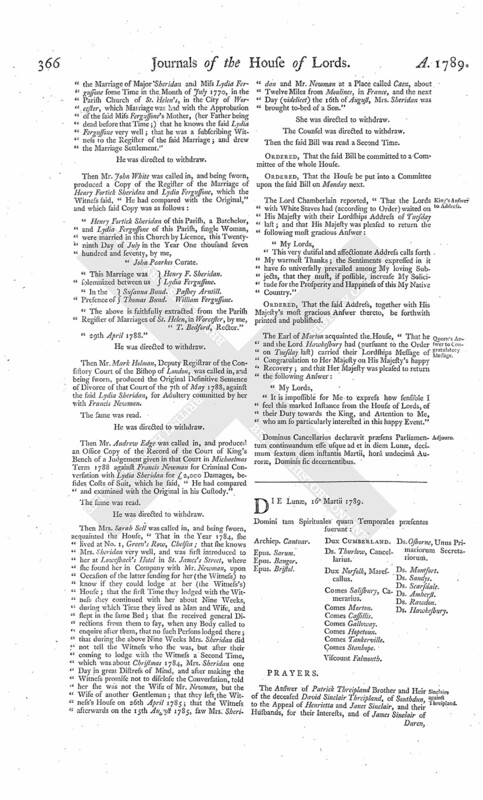 The House being informed, "That Mr. Cawne from the Mercer's Company attended:"
"The Accounts of the Wardens and Commonalty of the Mystery of Mercers of the City of London, from the 10th of October 1787, to the 10th of October 1788, directed to be laid before each House of Parliament by Two Acts, one of the 21st Year of the Reign of His late Majesty King George the Second, intituled, An Act for the Relief of the Annuitants of the Wardens and Commonalty of the Mystery of Mercers of the City of London;" and the other of the 4th Year of the Reign of His present Majesty King George the Third, intituled, "An Act for the Relief of the Bond and other Creditors of the Wardens and Commonalty of the Mystery of Mercers of the City of London." Dominus Cancellarius declaravit præsens Parliamentum continuandum esse usque ad et in diem Veneris, vicesimum diem instantis Martii, horâ undecimâ Auroræ, Dominis sic decernentibus. Epus. Norvicen. Ds. Thurlow, Cancellarius. Magistrates of Edinburgh against Erskine et al. The Answer of the Honourable Henry Erskine, Dean of the Faculty of Advocates, on Behalf of himself and said Faculty and others, to the Appeal of the Lord Provost, Magistrates, and Town Council of the City of Edinburgh, was this Day brought in. Rochied against Sir D. Kinloch et al. The Answer of Sir David Kinloch, of Gilmerton, Baronet, and others, to the Appeal of James Rochied, of Inverleith, in the County of Edinburgh, Esquire. With a Bill, intituled, "An Act for punishing Mutiny and Desertion; and for the better Payment of the Army and their Quarters;" to which they desire the Concurrence of this House. With a Bill, intituled, "An Act for the Regulation of His Majesty's Marine Forces while on Shore;" to which they desire the Concurrence of this House. With a Bill, intituled, "An Act to continue the Laws now in Force for regulating the Trade between the Subjects of His Majesty's Dominions, and the Inhabitants of the Territories belonging to the United States of America, so far as the same relate to the Trade and Commerce carried on between this Kingdom, and the Inhabitants of the Countries belonging to the said United States;" to which they desire the Concurrence of this House. With a Bill, intituled, "An Act for building a new Shire House for the County of Essex;" to which they desire the Concurrence of this House. 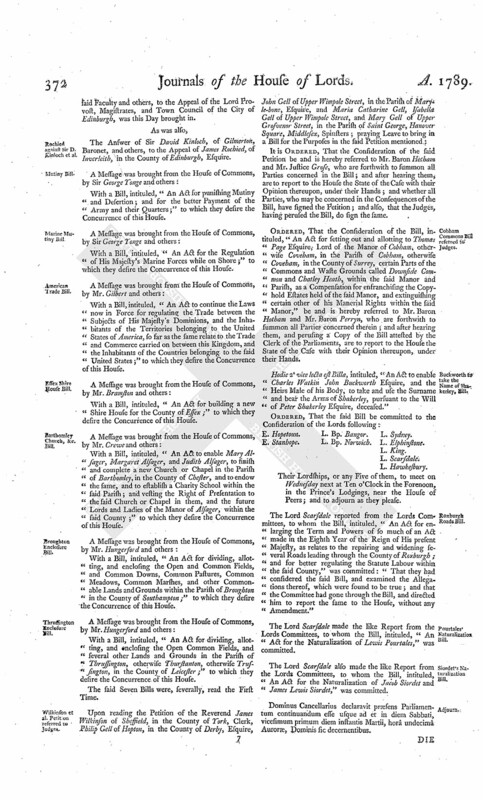 With a Bill, intituled, "An Act to enable Mary Alsager, Margaret Alsager, and Judith Alsager, to finish and complete a new Church or Chapel in the Parish of Barthomley, in the County of Chester, and to endow the same, and to establish a Charity School within the said Parish; and vesting the Right of Presentation to the said Church or Chapel in them, and the future Lords and Ladies of the Manor of Alsager, within the said County;" to which they desire the Concurrence of this House. 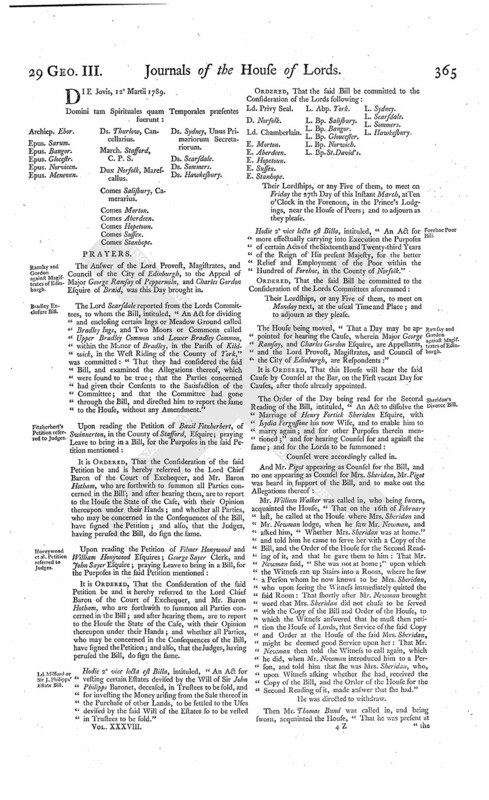 With a Bill, intituled, "An Act for dividing, allotting, and enclosing the Open and Common Fields, and Common Downs, Common Pastures, Common Meadows, Common Marshes, and other Commonable Lands and Grounds within the Parish of Broughton in the County of Southampton;" to which they desire the Concurrence of this House. With a Bill, intituled, "An Act for dividing, allotting, and enclosing the Open Common Fields, and several other Lands and Grounds in the Parish of Thrussington, otherwise Thurstanton, otherwise Trussington, in the County of Leicester;" to which they desire the Concurrence of this House. Wilkinson et al. Petition referred to Judges. It is Ordered, That the Consideration of the said Petition be and is hereby referred to Mr. Baron Hotham and Mr. Justice Grose, who are forthwith to summon all Parties concerned in the Bill; and after hearing them, are to report to the House the State of the Case with their Opinion thereupon, under their Hands; and whether all Parties, who may be concerned in the Consequences of the Bill, have signed the Petition; and also, that the Judges, having perused the Bill, do sign the same. Cobham Commons Bill referred to Judges. Ordered, That the Consideration of the Bill, intituled, "An Act for setting out and allotting to Thomas Page Esquire, Lord of the Manor of Cobham, otherwise Coveham, in the Parish of Cobham, otherwise Coveham, in the County of Surrey, certain Parts of the Commons and Waste Grounds called Downside Common and Chatley Heath, within the said Manor and Parish, as a Compensation for enfranchising the Copyhold Estates held of the said Manor, and extinguishing certain other of his Manerial Rights within the said Manor," be and is hereby referred to Mr. Baron Hotham and Mr. Baron Perryn, who are forthwith to summon all Parties concerned therein; and after hearing them, and perusing a Copy of the Bill attested by the Clerk of the Parliaments, are to report to the House the State of the Case with their Opinion thereupon, under their Hands. Buckworth to take the Name of Shakerley, Bill. Hodie 2a vice lecta est Billa, intituled, "An Act to enable Charles Watkin John Buckworth Esquire, and the Heirs Male of his Body, to take and use the Surname and bear the Arms of Shakerley, pursuant to the Will of Peter Shakerley Esquire, deceased." E. Stanhope. L. Bp. Bangor. L. Bp. Norwich. L. Sydney. Their Lordships, or any Five of them, to meet on Wednesday next at Ten o'Clock in the Forenoon, in the Prince's Lodgings, near the House of Peers; and to adjourn as they please. 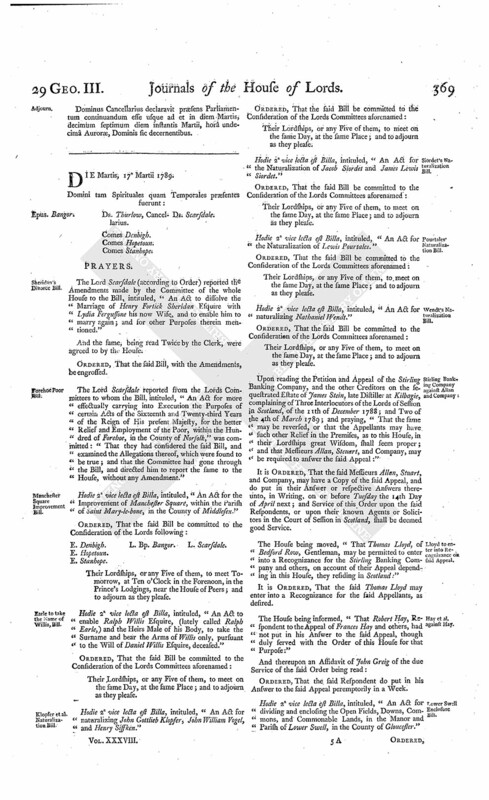 The Lord Scarsdale reported from the Lords Committees, to whom the Bill, intituled, "An Act for enlarging the Term and Powers of so much of an Act made in the Eighth Year of the Reign of His present Majesty, as relates to the repairing and widening several Roads leading through the County of Roxburgh; and for better regulating the Statute Labour within the said County," was committed: "That they had considered the said Bill, and examined the Allegations thereof, which were found to be true; and that the Committee had gone through the Bill, and directed him to report the same to the House, without any Amendment." The Lord Scarsdale made the like Report from the Lords Committees, to whom the Bill, intituled, "An Act for the Naturalization of Lewis Pourtales," was committed. The Lord Scarsdale also made the like Report from the Lords Committees, to whom the Bill, intituled, "An Act for the Naturalization of Jacob Siordet and James Lewis Siordet," was committed. Dominus Cancellarius declaravit præsens Parliamentum continuandum esse usque ad et in diem Sabbati, vicesimum primum diem instantis Martii, horâ undecimâ Auroræ, Dominis sic decernentibus.